Humbolt Rd and Mt. Mary Dr.
Mangiamio Pizza and Pasta is the latest restaurant, which is in the same building that was originally the Stratosphere supper club. It still has the beautiful high cliff view which overlooks the woods through large glass windows. 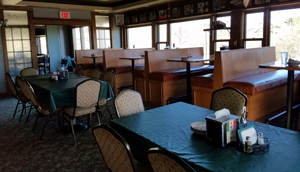 The atmosphere is very casual with large booths and many tables. As you walk in there is a large semicircular bar with a few televisions that hang above for viewing of different sporting events. The bartender greeted me immediately and was very friendly and told me of the specials for that evening. Mangiamio specializes in Italian cuisine. The menu is fairly large offering pizza, pasta, sandwiches and even broasted chicken. Their bread, sauces are made in house. I decided to order their meatball sandwich with a side salad which is included for only $6.95. 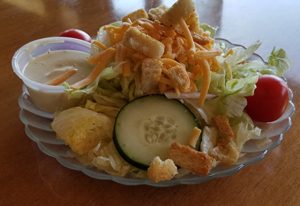 My salad came out first and it consisted of ice berg lettuce, cucumber slices, shredded cheddar cheese, croutons and tomatoes. The salad ingredients were fresh and the salad was medium in size. 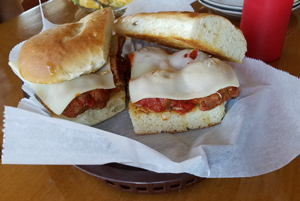 My meatball sandwich was huge, it consisted of 3 sliced very large meatballs, laid on top of a lightly toasted buttered homemade bun with spaghetti sauce, fried green peppers, onions and slices of mozzarella cheese melted on top. The sandwich tasted scrumptious. The meatballs are made in house with a mixture of beef and pork and spices they were dense in texture and very tasty as was the grilled buttered fresh homemade bun. If you want an extra meatball they only charge a dollar, but the three were more than enough. So as the translation in English for the word Mangiamio " Let's Eat!" and that is just what I did yummy.